The average American can expect to live nearly 79 years. That is a full 14 years after the typical retirement age of 65. While many Americans perhaps imagine themselves filling those 14 years of retirement in blissful leisure, many others decide to spend part of it working. 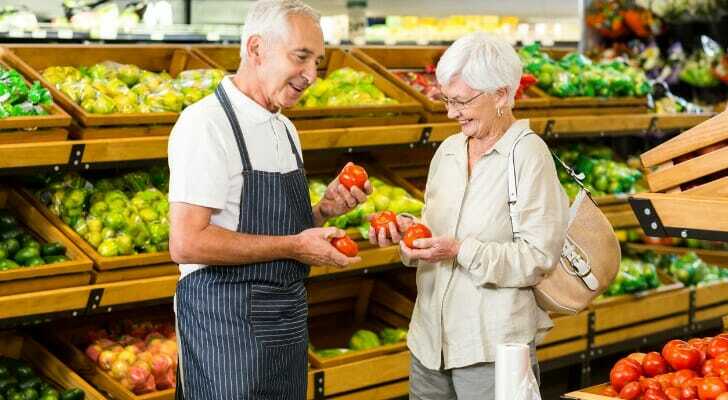 If you are the type of retiree who knows they will be spending some time in retirement doing some extra work, you will want to make sure you settle down in a place with plenty of working opportunity for seniors. 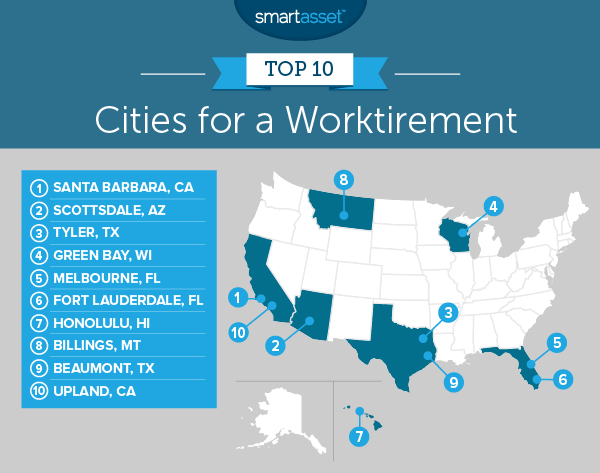 In order to find the best cities for a worktirement, SmartAsset looked at nine factors. We analyzed data for effective tax rate, unemployment rate, medical centers, retirement centers, recreation centers, seniors as a percent of overall population, median annual housing costs, median household income for seniors and senior unemployment rate. This is our third annual study on the best cities for a worktirement. Check out the 2017 version here. Avoid big cities – If you’re looking for a successful worktirement, you probably want to avoid big cities. Ranked as 15 worst places for a worktirement are cities like Boston, Philadelphia, Detroit and Chicago. The Northeast scores poorly – In past studies we have found that seniors tend to leave the Northeast for their retirements and for good reason. The highest-ranked Northeast city is Toms River, New Jersey at 52nd. Santa Barbara jumped 11 spots from last year’s analysis to claim the top spot this year. This city is a great place for a worktirement due to the number of amenities in the local area. It ranks in the top 20 for medical centers per 1,000 residents, retirement communities per 1,000 residents and recreation centers per 1,000 residents. Seniors also make up over 17% of the population, meaning there will be no trouble for local seniors looking to make friends. Work should not be hard to find, either. Seniors in Santa Barbara have an unemployment rate of only 1.3%. One of the most popular landing spots for retirees is also a great city for a worktirement. This city ranks well due to the local economic climate. The overall unemployment rate is only 3.5% and for seniors that figure falls below 3%. Plus, large portions of this city are dedicated to seniors. Over 22% of residents in Scottsdale are seniors and it ranks in the top 10 for medical centers per 1,000 residents. The only black mark on Scottsdale’s record is its housing costs. According to our data, the median home costs nearly $16,000 per year. Last year’s fifth-place finisher ranks third this year. Tyler is notable for its low effective tax rate. In part due to the lack of state income tax in Texas, Tyler has the 34th-lowest effective tax rate in our study at 16.1%. Seniors who come to Tyler should be able to find work if they want to. Only 1.1% of seniors in Tyler are unemployed, a top 20 rate. Green Bay can thank its low cost of living for its inclusion in this top 10. The median home costs only $9,240 per year, including Wisconsin property taxes, the lowest amount in our top 10. Green Bay should also be a relatively fun place to live for seniors. According to our data, it ranks 31st for recreation centers per 1,000 residents. However if you are thinking about working to make up for a retirement savings shortfall, Green Bay may not be the best place to do it. The city ranks last in our top 10 for median senior household income. Melbourne, Florida is something of a retiree paradise. Seniors make up nearly 22% of the population here and they don’t lack for things to do. This city ranks in the top 50 for recreation centers per 1,000 residents and top 15 for retirement communities per 1,000 residents. Plus, seniors here will have plenty of access to health care. Melbourne has 4.6 medical centers per 1,000 residents, the 14th-most in our study. Not many states are as retirement tax-friendly as Florida. Florida has no state income tax, which means Social Security, pension income and income from 401(k) plans or IRAs are not taxed. Overall we estimate that a working senior would pay an effective income tax rate of only 14.6% in Ft. Lauderdale. That is a top 10 rate. Ft. Lauderdale is more than just a tax haven for working seniors. This city leads the way in medical facilities per 1,000 residents and has the third-most recreation centers per 1,000 residents. There are many benefits to retiring in Honolulu. First of all, Hawaii is a beautiful place to live. But there are also plenty of high-paying jobs available in Honolulu to seniors. According to our data, the average senior household earns just under $60,000 per year and only 2.9% of seniors are unable to find employment. However not all of that income will be available for fun activities. Honolulu is an expensive place to live. The Census Bureau estimates the median home in Honolulu costs nearly $17,000 per year. Billings kept its spot in the top 10. This city has the lowest effective tax rate in our top 10, a good thing for any senior who wants to spend some time working. The economic conditions in Billings are also relatively favorable for workers, senior or not. The local unemployment rate is only 3.6% and for seniors it is 3.9%. After a hard day at work seniors in Billings will have plenty of opportunity for recreation. This city ranks in the top 15 for number of recreation centers per 1,000 residents. For seniors who are looking for an affordable place for a worktirement, Beaumont is a city worth a lot of consideration. Median annual housing costs in this city are under $10,000 per year and the effective income tax rate here is under 17%. The economic environment is also positive for people looking for work. The overall unemployment rate is 3.3%. 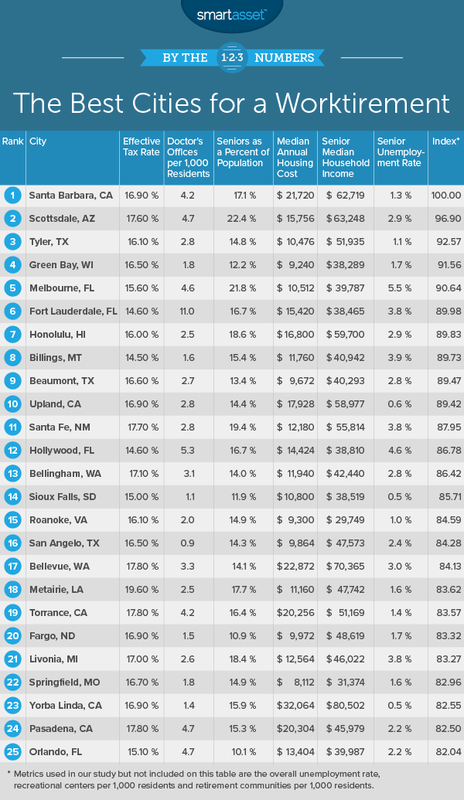 Beaumont ranks in the top 20% of all cities for each of those metrics. Our list ends in Upland, California. There are few cities in the country better for working seniors than Upland. According to our data, around one in 200 seniors is unemployed. For the non-seniors here, unemployment is not typically a problem either. Overall Upland has an unemployment rate of 3.8%. Anyone thinking about moving here will need to be aware of the cost of living. Upland is part of the Los Angeles metro area and the annual cost of housing here runs just under $18,000 per year. Effective tax rate. To calculate this we plugged in the following variables to the SmartAsset tax calculator: $35,000 in income, $15,250 of which comes from retirement income (like a 401(k) or an IRA), $13,724 from Social Security and $6,021 from work income. Medical centers per 1,000 residents. Data comes from the Census Bureau’s 2015 Business Patterns Survey. Retirement communities per 1,000 residents. Data comes from the Census Bureau’s 2015 Business Patterns Survey. Recreation centers per 1,000 residents. Data comes from Census Bureau’s 2015 Business Patterns Survey. Percent of residents who are seniors. This is the percent of residents age 65 or over. Data is from the Census Bureau’s 2016 1-Year American Community Survey. Median annual housing cost. Data comes from the Census Bureau’s 2016 1-Year American Community Survey. Median household income for seniors. This is the median household income for homes where the head of household is age 65 or older. Data comes from the Census Bureau’s 2016 1-Year American Community Survey. Senior unemployment rate. This is the unemployment rate for residents age 60 or over. Data comes from the Census Bureau’s 2016 1-Year American Community Survey. Unemployment rate. Data comes from the Census Bureau’s 2016 1-Year American Community Survey. First, we ranked each city in each metric. Then we found each city’s average ranking, giving equal weight to each metric. We assigned a score based on the average ranking. The city with the best average ranking received a 100. The city with the worst average ranking received a 0. Save early – You don’t want to be in a position where you need to dramatically cut expenses in retirement to make ends meet. In order to avoid this your best bet is to save early and often. Saving $1,000 today with 5% returns is equal to saving $4,300 30 years from now. Get expert advice – There are a lot of moving cogs in any retirement plan. You may have a 401(k) plan and an IRA, you may own your home, perhaps you have some inheritance and then there’s Social Security to factor in and taxes to pay. That’s a lot to consider for even the most seasoned planner. In order to make sure you have a solid retirement plan, you may want to work with a financial advisor. If you are not sure where to find an advisor, SmartAsset’s financial advisor matching tool can help. It does all the hard work of finding a local financial expert who fits your needs. First, you’ll answer a series of questions about your specific finances and then we’ll match you with up to three advisors in your area.